On April 17th 2018 at 08.09 GMT, Chiron entered Aries. It then re-entered Pisces between September 26th 2018 and February 18th 2019, when it re-entered Aries, staying there until 2026. It reaches Aphelion (furthest point from the Sun) on May 27th, 2021. The sign of Aries begins the twelve-fold cycle of the signs of the zodiac, representing the flaming forth of the individual sense of “I”, the pure flame of Being, before it becomes embedded in family, relationships, or career. It is the power of pure Yang, the masculine principle of ‘going forth’, fertilising, inspiring, initiating, bringing confidence and optimism. Chiron in Aries points us inward, towards this sacred fire which warms, heals and enlightens. The nature of Aries demonstrates the qualities of leadership, courage, straight-forwardness, lack of holding grudges, good humour, innocence and protectiveness towards those who are less fortunate. The shadow of Aries is more aggressive and over-reactive, demonstrating the ego-driven qualities of haste, speed, willfullness, disregard for others’ feelings, mindless action, agitation and so on. Aries is ‘The Warrior’. With Chiron there, what kind of warrior is this? A 'Wounded Warrior'? Often where Chiron is placed things seemingly ‘don’t work so well’, and thus we are directed towards the inner qualities represented by its house and sign. Here, in Aries, we might not feel like a ‘Warrior’. Indeed we may be uncomfortably aware of a sense of vulnerability, hesitancy, lack of confidence and timidity about decisions and taking action. But this is not The Truth of who we are … rather, it is part of the process of re-directing our energies towards the depth of our own Being. So in a very real way, these qualities we might be uncomfortable with are the precise means by which we embrace the positive qualities of Aries without being driven along mindlessly by its fiery initiatives! And moving towards the future, not by being adversarial and engaging in compulsive and futile battles, but by the clear focus released by honouring those who came before us. Re-membering. 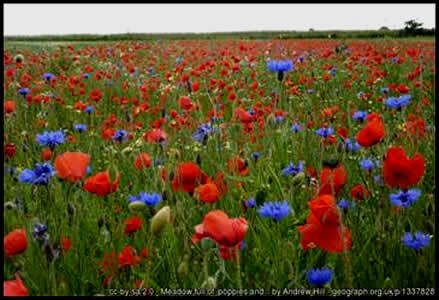 The picture above shows a field of poppies and cornflowers, which do often appear together 'in the wild'. The poppy has come to be the emblem of World War I, representing the hundreds of thousands of fallen soldiers who lie in the Earth, from whom the blood-red poppies spring forth.. Not only as eulogised in the poem “In Flanders Fields” written by Canadian physician John McCrae in 1915, but everywhere ... the entire planet Earth is replete with the remains of the dead. Bones, ashes … and the debris of so many wars: ancient, recent and current. See “Landscapes at War” for documentation of some poignant reminders of this, in Europe. In Thompson's horoscope we see Mars in Aquarius, opposite Chiron in Leo conjunct the North Node disposited by the Sun in Aries. The revealing of the truth about My Lai was followed by Thompson being reviled, rejected and threatened, from within the military and also the public. He suffered long-term PTSD and came to work with soliders returning from action to help them, serving as advocate and counsellor. Note that his paternal grandmother was full Cherokee, and her ancestors had suffered forced relocation and mass deaths of illness and hardship during the "Indian Removal Act" passed in 1830. See the "Trail of Tears". Transiting Pholus (a.k.a. "The Lid Comes Off") was approaching a conjunction with his Mars on 16.3.1968, the date of the My Lai massacre. There is perhaps an example of the 'ancestral cascade' which sometimes accompanies major transits of Pholus. In 1830, Neptune was conjunct his natal Pholus, and he lived to see the Neptune Return of this in 1993, the year after the book "Four Hours in My Lai" was published. 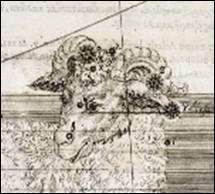 Thompson died on the very day of the conjunction of Chiron and Nessus (a.k.a. "The Buck Stops Here") in early Aquarius - 6.1.2006. It was said to have been found in the tomb of Tutankhamun, and in folk lore is associated both with the fragility of our mortality, and also with resurrection. The headlong rush of Aries is sometimes a flight from the past, a fear of being ‘re-absorbed’ into the matrix from which escape is sought. This fear can generate violence, should anyone get in the way of the dragon-fight we may be engaged in, and which we feel we must win … or else become extinct. 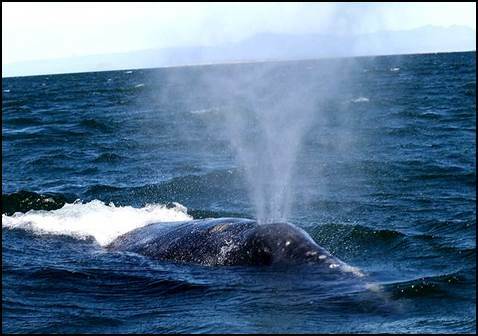 A compulsive adrenally-charged auto-response can also be a form of avoidance. Avoidance of the truth, of our vulnerability, our unresolutions and failures. Wanting eternally, indeed agitating to 'move on'. Then we are offered opportunities to take action in a truly individual way. Not driven by compulsion or agitation, the mature Aries realm is one of inspired action, un-premeditated, perfect and spontaneous, but totally situation-appropriate. This excellence is not cultivated by conformity, but by deeply protecting and releasing the flame of Being. And this cannot be contrived or ‘done to order’. It is the divine gift of being in the right place at the right time, in selfless action which has great power to turn situations around, transform negative energies and initiate new trajectories of action. "Ruby" (1993) by Linda Garland. Oil on Board. Used with kind permission. In the ancient Egyptian zodiac, Aries acquired the title “Lord of the Head”. Aries is ruled by Mars, but the Sun, associated with the heart, is exalted in this sign. So we are drawn by the “Lord of the Head” to the eternal flame of the heart-being. The heart chakra is in the centre or pivot of the chakra sequence, connecting ‘above and below’, just as the Sun is in the centre of the Solar System, its radiance reaching out in all directions. 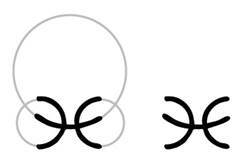 Similarly, following the symbolism of the Sun as the primary circle in the planetary glyphs, the symbol of Pisces can be derived from a three-fold Vesica Pisces, as beautifully shown in the work of Denis Klocek. 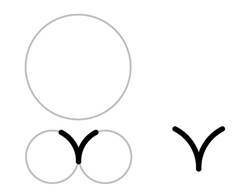 (5) The symbol of Aries can be seen in two circles, meeting at their tangent. So instead of ‘going off at a tangent’ as the energy of raw Aries may tend to do, here we have the poignancy of the ‘one’ seeking for – but also touching – the ‘Other’. Re-finding this sacred connection is perhaps the fundamental thrust of the powerful energy of Aries. 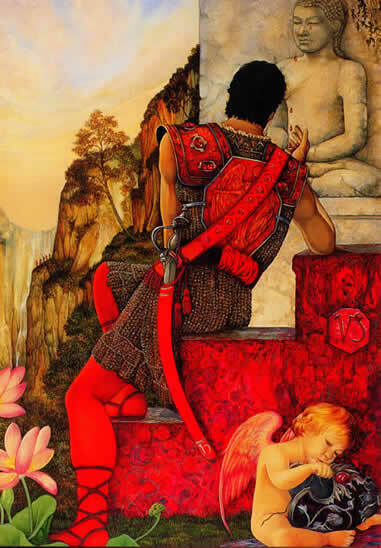 With the vulnerabilities, longings and fears of Chiron in Aries, we might at times feel nothing like a hero or a warrior! However, its gift is the courage and boldness to warmly and willingly embrace whatever enters the field of our inner awareness enabling the sword of insight, the flame of creativity and the power of right action to shine forth from our luminous core. This Chiron is the ‘Warrior of the Spirit’, where the inner heroic adventure is about piercing through our illusions, cutting down falsehoods, breaking apart old patterns and releasing the darkness of judgemental and adversarial habits. The clouds which obscure the Sun of our True Being are dispersed, and our inexhaustible vitality and radiance is revealed. 1. By Photograph taken by and (c)2007 Johnathan J. Stegeman (Midimacman) [GFDL 1.2 (http://www.gnu.org/licenses/old-licenses/fdl-1.2.html)], from Wikimedia Commons. 1a. Birth data for Ben Griffin is unknown, but he was born in 1977. If he was born early in the year, he has Chiron in Aries. 2. 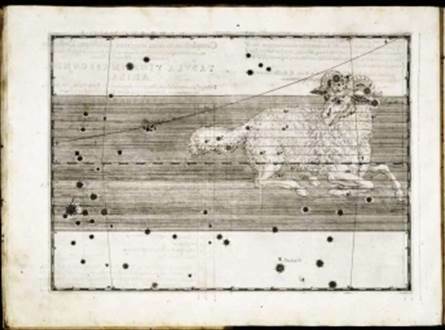 Constellation of Aries in ‘Uranometria’ (1603) by Johann Bayer. Picture courtesy of the Linda Hall Library of Science, Engineering and Technology, Kansas City, MO. 4. See ‘The Gospel and the Zodiac’ (2007) by the Reverend Bill Darlison. Duckworth Overlook, London and ‘Christ and the Cosmos’ (1985) by Gordon Strachan. Labarum Publications, Edinburgh.